"This cake isn't really green, it's the frosting that's green and unique." Make cake mix as directed on box except that in the place of water put pineapple juice. Bake according to the cake mix directions and take right from oven and place in freezer. Cake is ready to frost when cool on the bottom to touch. Mix crushed pineapple, instant pistachio pudding, and whipped topping together with a spoon, do not use an electric mixer. Frost cake and refrigerate for at least one hour. You must keep this cake refrigerated until ready to serve and then also keep any leftovers refrigerated. Red and Green Velvet Cake! I've been making this cake for years. It's one of my childrens favorites. The only thing I do different is use a pineapple cake mix. I'm making it today for Our St. Pats day get together. 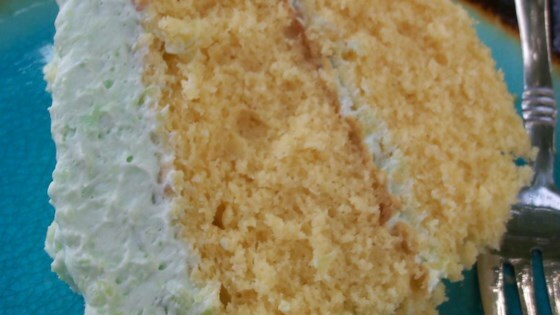 I thought the cake was really easy to make, tastes good, but in order to get the frosting green I had to add a little green food coloring. Everyone enjoyed this cake. It was so easy to make. That Jell-O brand pistachio pudding mix was perfect for the colour. I will definitely make this one again.